Sewing the last button on your kid’s Halloween costume, or running last minute to the store to pick up candy before it runs out? 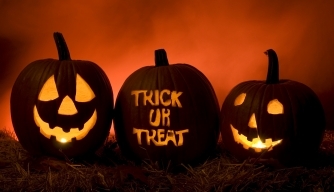 Did you ever wonder where the tradition of Halloween originated? And why and when the trick-or-treating activity started? The Frothingham Park staff did a little research to find out the origins of Halloween and trick-or-treating and this is what we found out. According to History.com, Halloween originated from the ancient Celtic festival of Samhain, where people believed that the dead came to life on the night of October 31. In honor of the dead, The Celts, who originated in Ireland some 2,000 years ago, lit bonfires and made sacrifices to honor the dead. During the festivities and paying homage to the departed, the villagers in an effort to scare away the phantoms and undesirable spirits, disguised themselves in costumes made of animal skin and put out banquet tables full of tempting edibles to calm the evil spirits. Centuries later, the tradition continued, and people started dressing as demons and frightening costumes and performed foolishly in hopes of getting food or drinks. The custom of performing in return for food is known as “mumming” and originated in the Middle Ages and is believed to be where the trick-or-treating concept came about. Trick-or-treating has been established in the US in 1951 after “Trick or treat” was featured in a Peanuts comic strip. To cement the idea and the tradition, Disney in 1952 unveiled a cartoon called “trick or treat” starring Donald Duck and Huey, Dewey and Louie. In the US, some colonists who celebrated the British Guy Fawkes in Britain where kids wore masks and begged for pennies and set bonfires, immigrated to the US and brought their ideas and traditions along. In addition, the Irish immigrants escaping the potato famine in the 1840s also brought in the costume aspect of the holiday. Both immigrants and their experiences contributed to the popularity of Halloween in this country. The Frothingham staff hopes this history of Halloween will add to your enjoyment of this holiday. Have a safe and happy Halloween.